For those who can afford it, go for it!!! Nicholas Kirkwood is obviously the new wonder kid in shoe design's world, winner of the Swarovsky Emerging Talent Award at the BFA, and close to be the Imelda' Footwear Designer of the Year. Susie Bubble had already nominated him. What about you? Our dearest despotic queen of shoes will close the nominations on Sunday. If you wanna vote, it's here. For his S/S 09 collection, Kirkwood carry on with his cut-away platform's signature. I think you might feel powerful and fierce wearing those. See more pics @ Imelda. 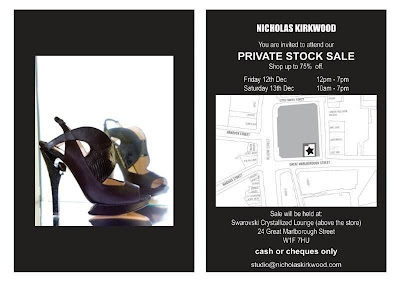 Wooooow And "Purple is HOT with Nicholas Kirkwood's creations" !!!!! Mmmh Mmmh Je crois que ces sandales sont un "fétichisant moyen" de réveiller la "fashion-vipère" OU le "Fashion-crotale" qui sommeille en toute fashionista . . . Yes everyone shud know the basics of selecting the perfect shoes..not all will know how to walk on "Charles David high heels"
Charles David high heels..gud job done..this blog will make every women learn abt shoes.. He is uber-talented! Love those sculptural platforms! Superbe ! Mais ça va percher à combien malgré le patin ? I love his shoes. They are stunning, especially the purple pair that I am always swooning over. i run on your blog today from some other blog...actually i was wondering omg who is miss glitzy??? cause i have blog and it's name is misslikey. @ Stilettostetico : fashion-crotale!!! je n'aurais pas trouvé mieux! @ Nicole : thanks for your comment, well I'm curious about the Charles David high heel, will check that right now. @ WendyB : I agree with you. @ Couture Carrie : Yes he is! First I didn't know what to think about these platforms but actually I find them really attractive. @ Frieda l'Ecuyère : je ne sais pas exactement mais à mon avis assez haut. @ coco : stunning is the word! @ Anonymous : welcome new fan! And I'm gonna take a look at your blog Miss Likey. Quelle création! je suis certain que ces shoes peuvent rendrent des looks totalement diaboliques! A ne pas mettre en toutes les.. jambes! Kirkwood is solely an engineer! His ability to actually conceive an idea and fashion it into these amazing soles is a gift. @ M1 : je le pense aussi. Maintenant, je pense qu'il faut trouver son équilibre là-dessus et adapter sa démarche et sa tenue. Pas évident pour tout le monde. @ Gerri Ward : yes, he's a gifted young designer. LOL....I know where your heart lays!